Structural overload causing roof damage. In worst cases snow can weigh over 200 kg/m². Production losses due to snow covered panels. The HAIN Solar Reverter is a fully automated snow removal process that uses a patented reverse technology. This method does not damage the solar cells, panels, inverter or other components. 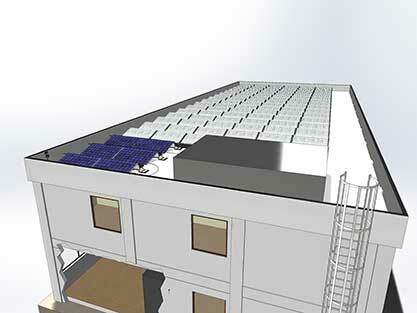 Panels manufacturer’s warranties are not affected. reduces weight and overall snow accumulation for commercial flat roofs. HAIN increases your winter production of your solar farm by automatically removing snow. The patented HAIN reverter is an electrical switchgear that reverses the function of the inverter within the photovoltaic system. The reverter takes AC from the mains and converts to DC. 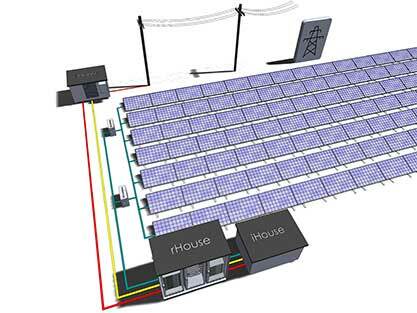 The DC voltage is carefully fed into the solar modules, thereby slowly heating them up. While the HAIN reverter is operating the inverter is turned off. As the HAIN system uses only 85% of the specified voltage and current load ability, it will never void any panel warranty.